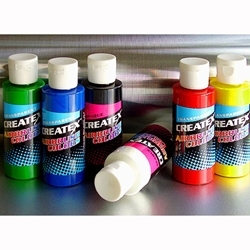 Createx Airbrush Color Starter Set - Six 2 oz. Bottles - Createx airbrush colors work incredibly well on any surface that works well with acrylics, such as fabric, paper, board, wood. For fabric, simply airbrush or hand paint your design and then heat set it with an iron to make it permanent. After heat setting, Createx paints are completely washable. They are ready to use right out of the bottle, or they can be thinned out with water to create washes or lighter shades. This set is an excellent way to get started with airbrushing. It includes six basic colors in 2 fluid ounce bottles: Light Green, Blue, Red, Yellow, Black, and White.